Commercial trucks such as tractor-trailers and big rigs are enormous vehicles, many times larger and heavier than personal cars and trucks. No matter how skilled the driver, accidents involving large trucks happen. These machines can do serious damage when involved in a collision, and yet carrier companies don’t appear to be doing all they can to prevent accidents involving semis and 18 wheelers. 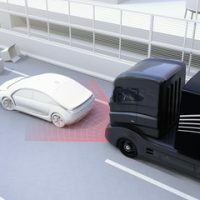 Though there have been major advances in collision avoidance technology, many carrier companies have failed to incorporate these systems into their fleet of trucks. Learn about how new safety advances could benefit average US drivers who share the road with large trucks below, and speak with a knowledgeable Southern California large truck accident attorney if you’ve been hurt in a car crash in the Antelope Valley. In recent years, vehicle safety and crash avoidance technologies have come a long way. Many new cars now offer automatic emergency braking, lane drift warning, front-crash warning, and blind spot warning systems that have been proven to prevent crashes and save lives. In fact, the Insurance Institute for Highway Safety estimates that over 107,000 crashes each year would be prevented or made less severe if all vehicles used these systems. While these systems are becoming more common on motor vehicles, their popularity has not taken hold among commercial truck carriers. The safety think tank Securing America’s Future Energy estimates that only 15% of commercial trucks on US roads make use of some sort of collision avoidance system. This organization estimates that as much as 40% of the nation’s commercial truck fleets could install crash avoidance or crash mitigation systems by 2020. “If anything, it’s more important that these advanced driver aids come standard on trucks than on cars. Tractor trailer trucks can weigh up to 80,000 pounds, and the consequences of a crash—no matter who is at fault—can be devastating,” noted Jake Fisher, the head of auto testing with Consumer Reports. While some trucking organizations balk at the additional costs entailed in updating trucks to have the latest safety technology, several companies which specialize in retrofitting trucks can offer updated safety systems for less than $1,000 per truck. Yet without a government mandate requiring that large trucking fleets use these critical technologies, these changes may be slow to come. If you or someone you love has been injured in a truck accident in the Antelope Valley, get help seeking damages by contacting the experienced and effective Palmdale personal injury lawyer Paul T. Kistler at 661-206-6990.